Two of the European Space Agency's (ESA) orbiting observatories have captured new and spectacular views of the gas pillars in the Eagle Nebula (M16) that were the subject of the iconic 1995 Hubble images dubbed "Pillars of Creation." In 1995, the Hubble Space Telescope's 'Pillars of Creation' image of the Eagle Nebula became one of the most iconic images of the 20th century. Now, two of ESA's orbiting observatories –Stunning new Herschel and XMM-Newton– have revealed new insights this enigmatic star-forming region. The pillars are only a small portion of the extensive nebulous region imaged in far-infrared by ESA’s Herschel Space Observatory, which shows cool dust and gas tendrils being carved away by the hot stars seen in the X-ray image from XMM-Newton. The wide-field optical image from the ESO MPG telescope puts the pillars into context against the full scale of the nebula, which is over 75 light-years across. The Hubble image hinted at new stars being born within the pillars, deeply inside small clumps known as 'evaporating gaseous globules' or EGGs. Owing to obscuring dust, Hubble's visible light picture was unable to see inside and prove that young stars were indeed forming. The ESA Herschel Space Observatory's new image shows the pillars and the wide field of gas and dust around them. Captured in far-infrared wavelengths, the image allows astronomers to see inside the pillars and structures in the region. In parallel, a new multi-energy X-ray image from ESA's XMM-Newton telescope shows those hot young stars responsible for carving the pillars. Combining the new space data with near-infrared images from the European Southern Observatory's (ESO's) Very Large Telescope at Paranal, Chile, and visible-light data from its Max Planck Gesellschaft 2.2m diameter telescope at La Silla, Chile, we see this iconic region of the sky in a uniquely beautiful and revealing way. 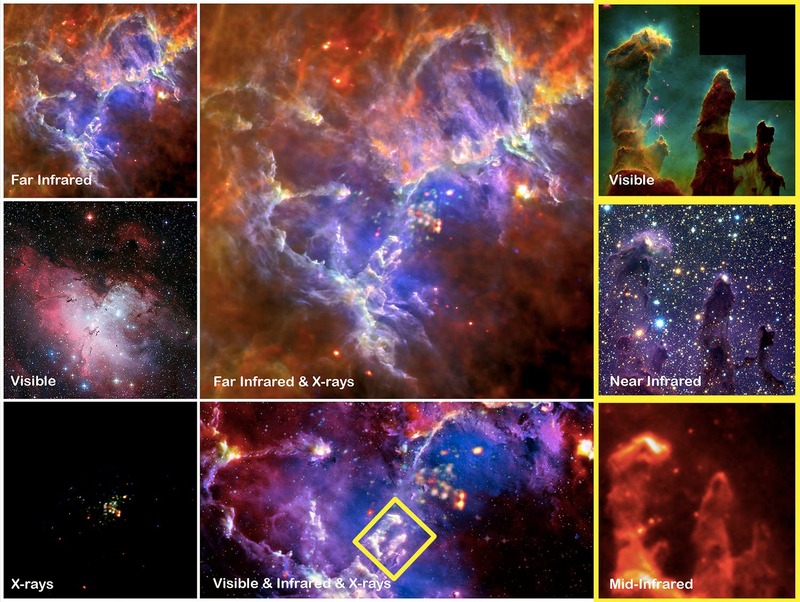 In visible wavelengths, the nebula shines mainly due to reflected starlight and hot gas filling the giant cavity, covering the surfaces of the pillars and other dusty structures.Multi wavelength video of the Eagle Nebula. 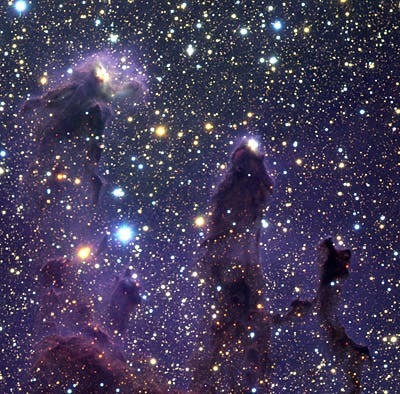 At near-infrared wavelengths, the dust becomes almost transparent and the pillars practically vanish. In far-infrared, Herschel detects this cold dust and the pillars reappear, this time glowing in their own light. The 8.2m-diameter VLT’s ANTU telescope imaged the famous Pillars of Creation region and its surroundings in near-infrared using the ISAAC instrument. This enabled astronomers to penetrate the obscuring dust in their search to detect newly formed stars. The research into the ‘evaporating gaseous globules’ (EGGs), which were first detected in the Hubble images, needed the near-infrared capabilities and resolution of the VLT to peel back the layers of dust and detect the low-mass young stars cocooned within the EGG shells. The near-infrared results showed that 11 of the 73 EGGs detected possibly contained stars, and that the tips of the pillars contain stars and nebulosity not seen in the Hubble image. In 2001, Very Large Telescope near-infrared images had shown only a small minority of the EGGs were likely to contain stars being born. However, Herschel's image makes it possible to search for young stars over a much wider region and thus come to a much fuller understanding of the creative and destructive forces inside the Eagle Nebula. 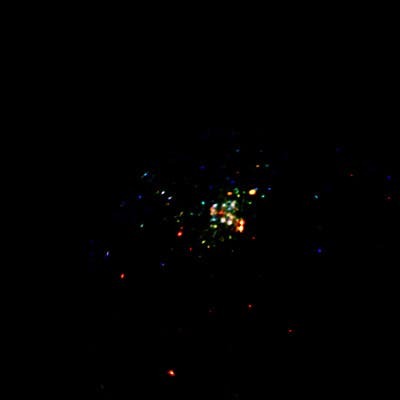 Earlier mid-infrared images from ESA's Infrared Space Observatory and NASA's Spitzer, and the new XMM-Newton data, have led astronomers to suspect that one of the massive, hot stars in NGC6611 may have exploded in a supernova 6000 years ago, emitting a shockwave that destroyed the pillars. 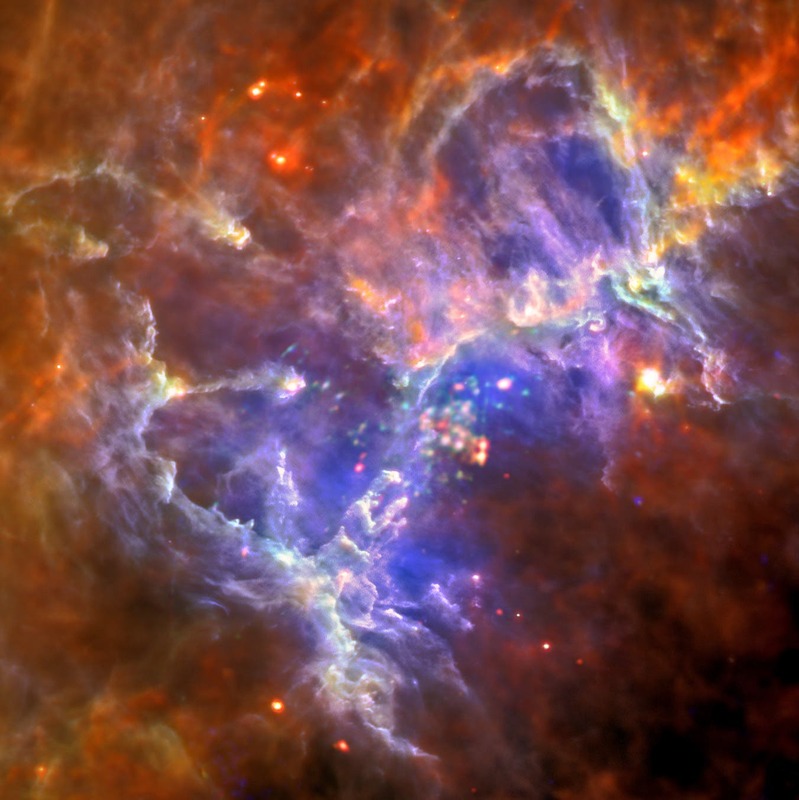 However, because of the distance of the Eagle Nebula, we won't see this happen for several hundred years yet. Powerful ground-based telescopes continue to provide astonishing views of our Universe, but images in far-infrared, mid-infrared and X-ray wavelengths are impossible to obtain owing to the absorbing effects of Earth's atmosphere. Space-based observatories such as ESA's Herschel and XMM-Newton help to peel back that veil and see the full beauty of the Universe across the electromagnetic spectrum. XMM-Newton’s images of the Eagle Nebula region in X-rays, above is colour-coded to show different energy levels (red: 0.3–1 keV, green: 1–2 keV and blue: 2–8 keV) is helping astronomers to investigate a theory that the Eagle Nebula is being powered by a hidden supernova remnant. The researchers are looking for signs of very diffuse emission and how far this extends around the region. They believe that an absence of this X-ray emission beyond that found by previous orbiting space telescopes (Chandra and Spitzer) would support the supernova remnant theory. With regions like the Eagle Nebula, combining all of these observations helps astronomers to understand the complex yet amazing lifecycle of stars.